Yes, folks, there is still hope for the DROID Incredible 2. After missing a self-imposed deadline to update the device to Ice Cream Sandwich, HTC has been semi-quiet on whether or not an update was still in the works. We were assuming at this point that it and the Thunderbolt were never going to be updated, as it has been almost 3 months without word. Well, until last night. One of our readers poked at HTC on Twitter, asking if they had forgotten about the Incredible 2. 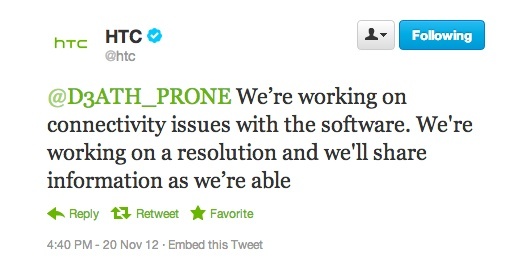 HTC responded, saying that they are still working on the update, but are having connectivity issues with the software. Once they figure those out, they plan to share information with the world. I don’t know about you guys, but rarely do we get this kind of openness from an OEM on an update. I know they didn’t pinpoint a date to release it, but when was the last time any of them gave a progress report on an update that included technical details? Very interesting.